With some help from Parsec, the Samsung 960 Evo PCIe 3 x4 M 2 SSDs deployed in RAID 0 and Windows 10 64 was successfully installed. For those trying to do this, a key thing to note parsec outlined is that you may need to clear CMOS for each attempt if you can't install windows successfully the first time. Also, you can't change from RAID mode in BIOS from what I understand, or you will have to start from scratch. Also, key points not listed in some of the documentation is that you need to boot the Windows install USB selecting the UEFI boot option (F11 at start to select the boot option). Also, a second USB is needed with the appropriate Intel RAID drivers which need to be searched for and installed at the start of the windows installation. Parsec outlined this process in detail. So, why is it NOT possible to install windows 10 64 bit on RAID0 using the new Samsung 960 Evo SSDs in an ASRock Z170 Extreme 7+??? I found this youtube video to be useful as a reference, but as outlined in another thread, I've followed all the necessary steps to set up RAID0 but can never get the RAID volume to appear to install windows 10 64 bit. Do any of the other Motherboard brands allow the Samsung Evo 960 SSDs to be set up in RAID0 utilizing the Pcie 3 x4 capability? The glaring lack of ASRock documentation in this area is not helpful. There is a lot of confusion over using the "right" Intel RST drivers etc too. I wish there was a straight forward, easy to search ASRock document outlining the best practices, and providing detailed steps etc. If there is one, it's really well hidden. First of all, do you know if you SM951 is the NMVe version, or the AHCI version. There are two versions. This really does not make much of a difference, but is worth knowing. Next, what M.2 to PCIe adapter are you using? I assume you are using the PCIE2 or PCIE3 slot, since those are the only ones that would work. Slotted into the PCIE3 slot. You said the SM951 is recognized in System Browser. What does it say the device it recognizes is? Given your description, your USB Win 10 installation media was not done correctly. I have no idea why your installation media, "... is on a USB drive formatted in the GPT drive format". I never had that in my guide. I know, you got that from another guide. Users get the GPT thing mixed up all the time, so I assume that is what happened here. The Windows Creation Tool does not know what drive you are installing on, and I never let it create the USB flash drive. Sorry to say, but that was the mistake you made. We have some cleanup of the USB flash drive to do. Also, if your flash drive is larger than 16GB, they tend to not work correctly. An 8GB flash drive is big enough, 16GB is what I happen to use. Finally, click Next to actually start the installation. Should go pretty fast. When the PC restarts, do NOT go into the UEFI and do NOT remove the USB flash drive until Windows is finished installing and you are looking at the Win 10 desktop. Done. If you have more problems, let us know, but I can't spoon feed this any more than that. I don't get 5 new partitions though, only 4 but assume this is also right. Will post an update once it's complete. FYI - I do already get to this point, the problem is once it's installed BIOS doesn't seem to pick up the 'Windows Boot Loader' so hence is never able to boot. But will let you know soon if it has worked. Also, how do I do a UEFI/BIOS clear if it still doesn't work? UPDATE 2: Ok, found another USB drive and performed the same instructions as above to get the ISO on there to boot. Also reset the CMOS (jumper 2-3 to clear) for good measure and I'm gettng the same result.. I've now spent a good few hours researching and trying to get this working on my PC for a while now but whatever I do results in the same thing: The SM951 drive is not bootable even after installing Windows 10.
or Insert Boot Media in selected Boot device and press a key_"
"Windows Boot Loader" or "Windows Boot Loader: <SSD name>"
My motherboard is the z77 Extreme4. I've installed Windows 10 on an Intel 750 NVMe SSD on my Z77 Extreme4 board, and it worked fine. But I always had a problem with the Beta P2.90M UEFI version, once Win 10 was installed. I cannot get into the UEFI without doing a UEFI/BIOS clear. I assume a side affect of even getting NVMe support on a Z77 board, which is amazing period. Do you have a download Win 10 ISO file somewhere? Or did you just use the Create USB flash drive with the Windows tool when the download was complete, which you said you did. If you don't have the ISO file by itself, you get to download it again, but do NOT use the Windows tool to create the USB flash drive Win 10 installer. Skip that part at the end of the Win 10 ISO download procedure, and you'll have the ISO file in whatever your browser's download folder is. Once you have a Win 10 ISO file, we can fix your USB flash drive and start over. Put the USB flash drive in a USB 2.0 port on whatever PC you can use, and start a Windows Command Prompt (Admin). When you see the C:\Windows\system32> prompt, type in diskpart and press Enter. Type in list disk and press Enter. Find the USB flash drive in the list of drives, and find its Disk number. Let's say it is Disk 3. Type in the following commands one at a time, and press Enter after each one"
You can close the Command Prompt window. The USB flash drive is now in the correct format to accept the Win 10 ISO. Nothing more needs to be done to it, except you could give it a name if you open its Properties. With that USB flash drive in the PC with the Win 10 ISO file, go to the ISO file. Left click on the ISO and in the list displayed select Mount. You'll then see the actual list of files and folders in the ISO file, boot, efi, sources,... setup. Right click and select all the folders and files so they are all highlighted, similar to a drag and drop selection. Left click in the highlighted area and find Send To, the USB flash drive should be in the list. Select it and it will take several minutes to write the ~3.7GB to the USB flash drive. When that is done, the USB flash drive with Win 10 is ready to use. You'll probably find the "Mounted" ISO file as a device with a drive letter in Windows Explorer. Left click on it and select Unmount to get rid of that. Now put the USB flash drive in a USB 2.0 port on the Z77 Extreme4 board, that I hope ONLY has the SM951 in it, NO OTHER drives, besides the flash drive. Start that PC, go into the UEFI and select the, "UEFI: <USB flash drive name> to boot from, and Save and Exit to start the installation. Do NOT select an Express Installation, select a Custom Installation. The SM951 should be recognized by the Win 10 installer. Delete ANY and ALL partitions on the SM951, it MUST be completely unformatted. Then click on the New button to format the SM951. You'll see a message about creating partitions, just click OK to continue. You should get five partitions on the SM951, that is correct. Although some sites include RAPID mode in their results, and it may be considered cheating the benchmarks, if they specified the hardware platform, and that RAM caching is enabled, it may have some actual purpose for users, and could also be a real way to fetch some awesome performance gains for gaming and applications, with much lower outlay on technology. Would you mind kindly sharing a few of those links for me to have a look at closer? Thanks! There are also 3rd party applications that perform similarly to Samsung's RAPID, that may be introducing the ability to define what specific information is cached, as opposed to a straight bit level cache everything, which would further add merit and purpose to the use of RAM caching. How is X99 outdated? You can use PCIe NVMe SSD directly on the PCIe 3.0 lanes from the CPU, rather than the DMI3 lanes from the chipset. Is DMI3 faster? No. Sure RAM caching or a RAM drive like ASRock's XFast RAM, is faster than any SSD. 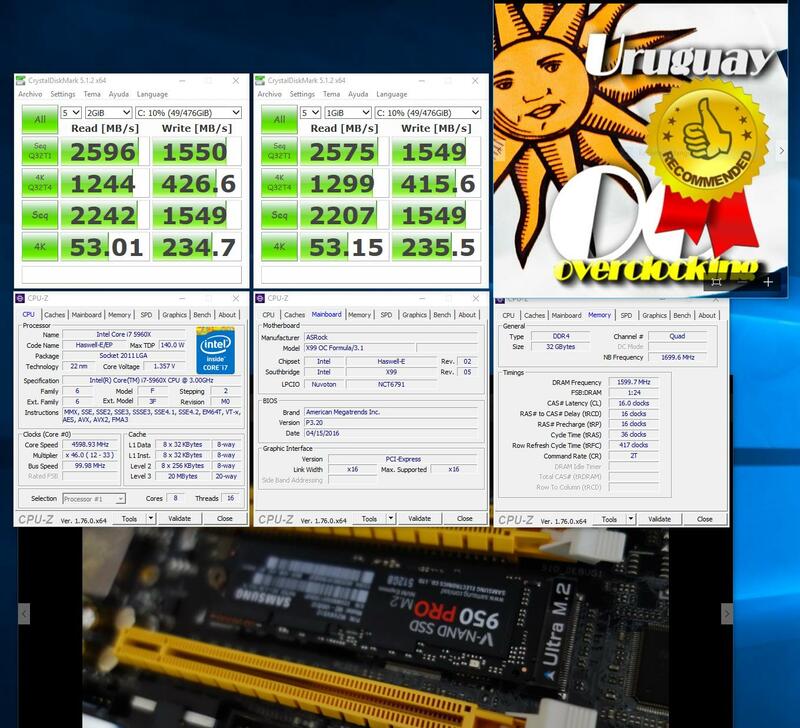 DDR3 and DDR4 memory is faster than NAND storage, nothing new there. They've been around for years, so why aren't they more commonly used? RAM caching and RAM drives are not permanent storage. Remove power from the PC, and their contents is gone. Or if configured right, written to a SSD or HDD, at the speed of those devices, when the PC is shutdown. But if a power loss occurs, any data in a RAM cache or RAM drive is lost. RAPID has the same limitation. My complaint about RAPID is some people seem to believe it is the SSD providing those speeds, when it absolutely is not. If you were bench marking SSDs as a hobby, would you want your efforts compared to RAM drives or a drive using a RAM cache? The only data stored in RAPID's RAM cache is new data "written" to the RAPID enabled SSD. That data is written to the RAM cache, and then written to the SSD. If you open an older file on a RAPID system, it won't be read at the speed shown in a RAPID enabled SSD benchmark. The benchmark test data is in the RAM cache, not the SSD. The joke is, after the benchmark test is done, the test data would be written to the SSD, if the benchmark program did not delete it, as it normally does. Is any writing to the SSD done at the speed shown by a benchmark run on a RAPID enabled SSD? No, it is written at the speed the SSD itself is capable of. If anyone thinks RAPID makes their Samsung SSD faster, they are wrong. When a RAM drive or RAM caching is used, when the PC is shutdown or restated, the data in the RAM drive or RAM cache must be written to a standard SSD or HDD first. Otherwise, it is lost. Why doesn't the file system of an OS do that automatically now? Cache data to RAM, and then write it to permanent storage behind the scenes, as RAPID does. Sounds simple, right? Write caching exists in Windows now, and in the IRST AHCI and RAID driver. But the size of the cache is small, for many reasons. 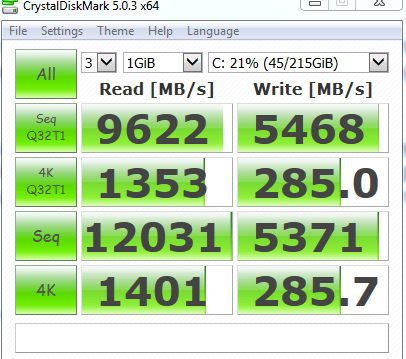 Here are two Crystal Mark Runs in Win7 64x, first is a SSD Boot Samsung 840 250ish meg holding the OS. Not sure why the SSD is kicking the RAID 0's numbers so badly. Shouldn't it be the other way around? jesus that is superfast !! !